We recommend that you store and download your website list from a secure web server (https://), to help protect against data tampering. After the list is downloaded, it's stored locally on your employees' computers so if the centralized file location is unavailable, they can still use Enterprise Mode. Turning this setting on also requires you to create and store a site list. For more information about creating your site list, see the Use the Enterprise Mode Site List Manager topics. For only the local user: Open a registry editor, like regedit.exe and go to HKEY_CURRENT_USER\Software\Policies\Microsoft\Internet Explorer\Main\EnterpriseMode. For all users on the device: Open a registry editor, like regedit.exe and go to HKEY_LOCAL_MACHINE\Software\Policies\Microsoft\Internet Explorer\Main\EnterpriseMode. All of your managed devices must have access to this location if you want them to be able to access and use Enterprise Mode and your site list. 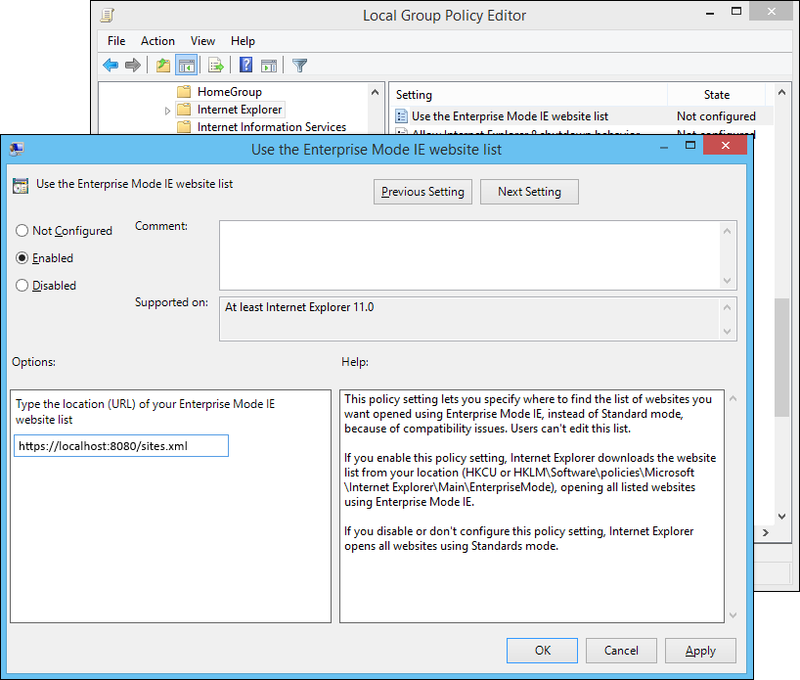 For information about how to create and use an Enterprise Mode site list, see Use the Enterprise Mode Site List Manager.